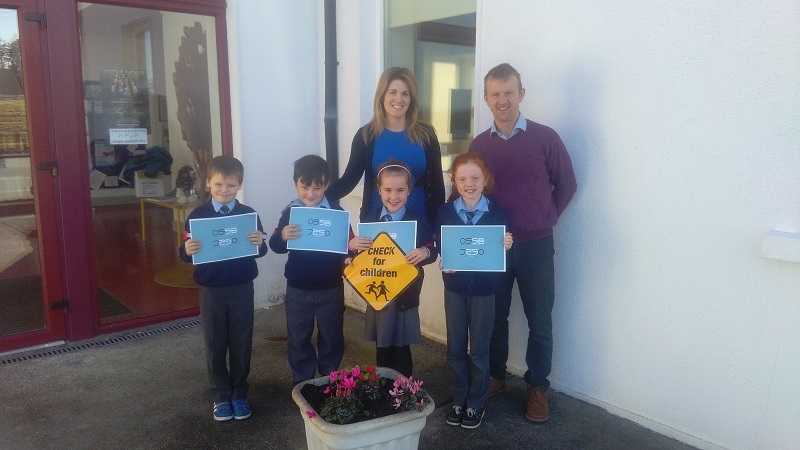 A primary school in Co. Mayo was the setting for the recent launch of the Junior Road Safety Officer scheme (JRSO) in Ireland and it is one of the first schools to sign up to this new initiative which captures the imagination of children while reinforcing the road safety message. Pupils aged between nine and 11 are recruited to the post of JRSO in a variety of ways, including completing an application form and attending an interview. The successful pupils will be empowered to highlight road safety issues within their school by raising awareness amongst fellow pupils, their teachers and the local community whilst maintaining an important link with their Road Safety Education Officer. Students from Derrywash NS with Mrs Aishling McDonnell, the Acting Principal, Noel Gibbons, Road Safety Officer, Mayo County Council. The JRSO scheme for fifth and sixth class pupils is being launched in Derrywash national school Castlebar. Mayo County Council road safety office has helped schools to appoint JRSOs in the school. Supported by a member of staff, two JRSOs in each school take responsibility for ensuring their fellow pupils understand what they can do to keep themselves safe. Their responsibilities includes delivering road safety assemblies, running competitions and maintaining a road safety notice board. At an event to mark the launch, the JRSOs learnt about the importance of their role and what is expected of them. They also take part in workshops covering topics including making a radio commercial and learning how to develop catchy yet meaningful slogans. Noel Gibbons, road safety Officer, said: "Young people are generally open minded and eager to learn, particularly when the subject matter is meaningful and relevant to their everyday lives. The JRSO scheme will enable the young officers to help their friends and others in their school to be aware of the importance of road safety and what they can do to keep themselves safe. It will also be a significant help in encouraging the development of their independence." Mrs Aishling McDonnell, the Acting Principal in the school said "Derrywash National School previously received a national award in 2008 from the RSA for its recording of the safe cross code with comedian Brendan Grace and road safety is still a top priority within our school, the main aim of this scheme is to give children the opportunity to identify road safety problems within their own school area and helps them to pass important messages to their peers about keeping safe when they are out and about and it aims to give the children a good grounding in road safety education as they prepare to make the transition to secondary school - the point at which many children begin to travel independently for the first time"